(Newport, Oregon) – From May 14 to May 17, several detour routes have been established for motorists traveling between Corvallis and Newport on Highway 20 while the road is closed for some blasting work. Among those detours, motorists will have to take the detour of Highway 34 between Corvallis and Waldport, adding some extra time to the trip – so travelers are urged to plan accordingly. Map of detours at bottom of article. Oregon Department of Transportation (ODOT) says the suggested commercial truck route is 99W to Highway 22 to Highway 18 (from Salem to Lincoln City) for those three days. Some passenger vehicles and trucks may find it easier to take Highway 126 from Eugene to Florence. 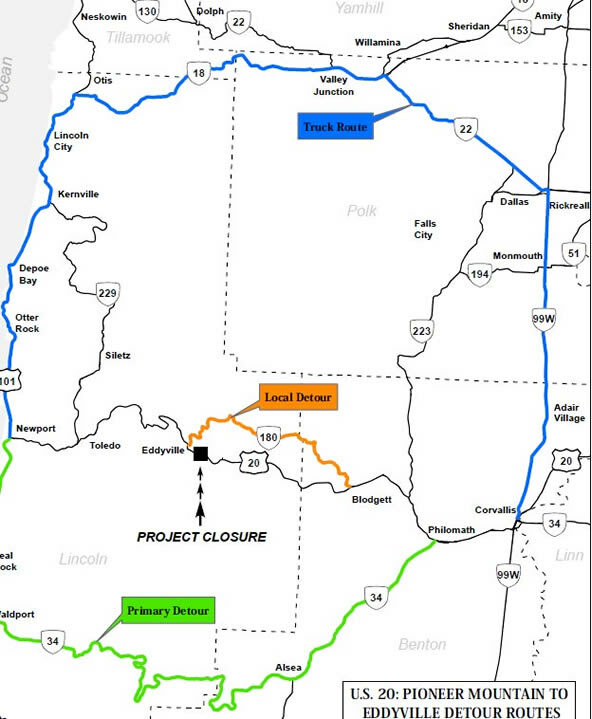 ODOT will be blasting 900 feet off the eastern slope at milepost 22, just east of Eddyville, for those three days. The work is part of the new alignment of Highway 20, called the US 20 - Pioneer Mountain to Eddyville project. ODOT said the work could not be done in several smaller blasts, which would result in numerous unpredictable road closures. The highway closure could not be done in summer, and could not be done on other weekends in May, as these had major holidays and events for people traveling to and from the coast. The Pioneer Mountain to Eddyville project is scheduled to end late in 2011, and will shave some 6.5 miles off the highway – a stretch that is notoriously slow, winding and even dangerous. It will cut the drive time by as much as 20 minutes when completed. Highway 20 accommodates about 4,400 vehicles each day. The closure happens at milepost 22 from Friday, May 14, at 6 p.m. to Monday, May 17, at 6 a.m.
OR 34 is the primary passenger and recreational vehicle detour. Truck restrictions on OR 34; call ODOT Permits, 503-373-0000, with questions. The suggested truck route is 99W to OR 22 to OR 18.